Killer Characters: Who Dressed the Dogs Up? Who Dressed the Dogs Up? Is anyone out there? It’s me Betty Foxx, Cookie’s right-hand Gal Friday at the Bow Wow Boutique. I’m checking in to see if you’ve heard the news. See, there’s been a lot of scuttlebutt around town the past few weeks about the upcoming annual Laguna Beach Pet Parade. What? You’ve never heard of it? Well, it’s a big fundraiser for the local animal shelter. The truth is, the parade is a really a pet contest with prizes for the most handsome, prettiest, and best costumed pet. I was thinking about entering my own Raider boy in the parade. As a St. Bernard, he drools…a lot. Some people don’t find that as adorable as I do, so I decided against the handsomest category, and am going with the best costume group. Anyway, back to the gossip. The first time I heard this little gem, I was sitting on the patio at my favorite coffee shop drinking an iced caramel macchiato, minding my own business, when I overheard two women whispering about the parade. I had to lean in a little bit to hear them, but I swear they said they were on the parade committee and needed another judge. You’ll never guess who they were thinking about asking. Cookie! Well, when I heard her name I may have shouted, “no” and startled the one little gal enough that she spilled her coffee. I offered to buy her a new one, but she wasn’t interested. I asked if it was true, about Cookie, but they wouldn’t confirm nor deny. Don’t get me wrong, Cookie would make a great judge. That’s the problem. This type of gig is right up her alley. If she agreed to judge, she’ll never vote for me and Raider for the win. I can hear her already touting ethics and integrity, and ensuring there isn’t the slightest appearance of partiality. Ugh! We’ll never stand a chance. So now I’m on a quest to dig up the truth. No sense in wasting time picking out a costume if we don’t have a shot at winning. One last piece of gossip. I heard the authors of the Pampered Pets Mystery series are giving away a copy of their latest book, Raiders of the Lost Bark. All you have to do is leave a comment on what type of costume you think would be best for a St. Bernard puppy for a chance to win. Don’t forget to include your email address or they won’t have a way to notify the winner! Sparkle Abbey is the pseudonym of two mystery authors (Mary Lee Woods and Anita Carter). They are friends and neighbors as well as co-writers of the Pampered Pets Mystery Series. The pen name was created by combining the names of their rescue pets--Sparkle (Mary Lee's cat) and Abbey (Anita's dog). If you want to make sure you're up on all the Sparkle Abbey news, stop by their website and sign up for updates at sparkleabbey.com. A polar bear sounds like fun. :-) See you Saturday, Kristin! 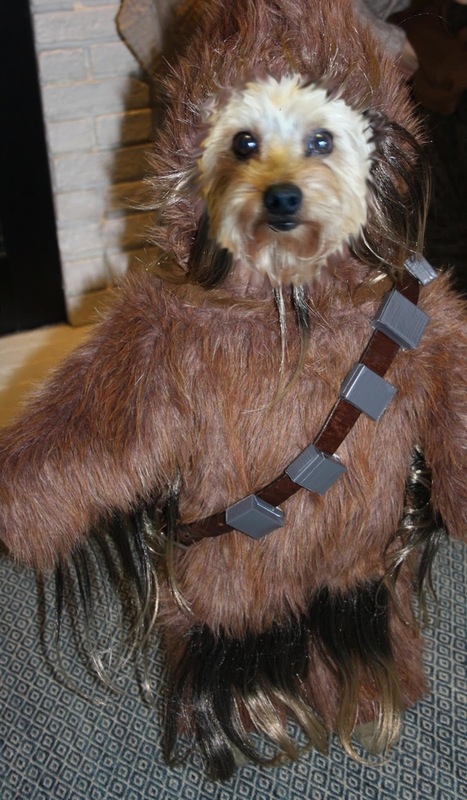 Ha, that Chewie costume is pretty darn cute! Otherwise, maybe go with the classic Swiss rescue dog theme. It is! LOL A rescue dog sounds like a fine idea! Seems like a theme here with the barrel... LOL He'd be a handsome one! I'm not one to dress up my pets but I think he would look good with a barrel around his neck. Love this series. Sparkle thinks up the BEST titles ever. Since a St. Bernard is gentle as a lamb, how about a lamb costume? mlarkin at rmrgroup dot com. Thanks, Mary Louise! A lamb would be adorable. Maybe the Tin Man from the Wizard of Oz would be cute. Oh, the Tin Man. That's a great idea! I'd go for the classic rescue dog barrel. That would be cute and easy. I think a hobo costume would be cute. That would be. What a cute idea! LOL Love it! Jabba the Hut and Chewy would be a great pair. Thanks Melissa! A St. Bernard pup is perfect for a bear costume. A saddle with a small rider? That would be fun. We can just see the rider bobbing up and down as Raider runs across the lawn! How about a tutu and a glittery crown. Boy dogs can wear crowns too. :) We're glad you left a comment! Oh, that's original! Great idea. He should totally go as a lion. I don't know why but I can totally picture it now. Lol! LOL Put a fluffy mane around his neck and call it good. We like it! LOL We can only imagine trying to put a costume on a Rotty. Arrrr! With a hook? That would be classic! I'm just back from the Star Trek 50th Anniversary convention in Las Vegas so I have Trek on my mind. Most of the service animals there had Trek outfits. With a cute cowboy hat and boots! Love it. I think a Saint Bernard should be dressed up in a nanny outfit just like the one in Peter Pan...I always thought that was the cutest...Thank you for the contest. The nanny from Peter Pan would be adorable, Marilyn. i think a saint puppy dressed as a poodle or a chihuahua would be fun! All of my ideas were already taken. I think the St. Bernard puppy would look good as himself, or a lamb or as some type of bear. I also think a lion would really be amazing. Great minds think alike! Thanks for leaving a comment! That seems to be a popular idea. I'd love to see a Saint Bernard puppy dressed up as a lion! A horse or a pirate! Thanks for the chance! A scruffy little scarecrow would be cute.